"A refreshing treat on any day." Mix pineapple with juice and pudding mix in a large bowl. 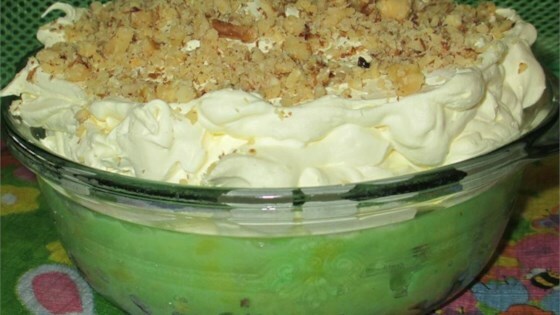 Mix whipped topping and marshmallows in another bowl and spread over pudding mixture; sprinkle with walnuts. Cover and refrigerate until ready to serve. Very nice taste, easy to assemble. Loved by all. My mom made this year's ago! I noticed it in the store the other day - bought & made a bowl and enjoyed it very much. I made this recipe but combined all ingredients together and it was delicious. I hadn't had this in such a long time and made it for a St Patrick's Day celebration. It was a hit! !